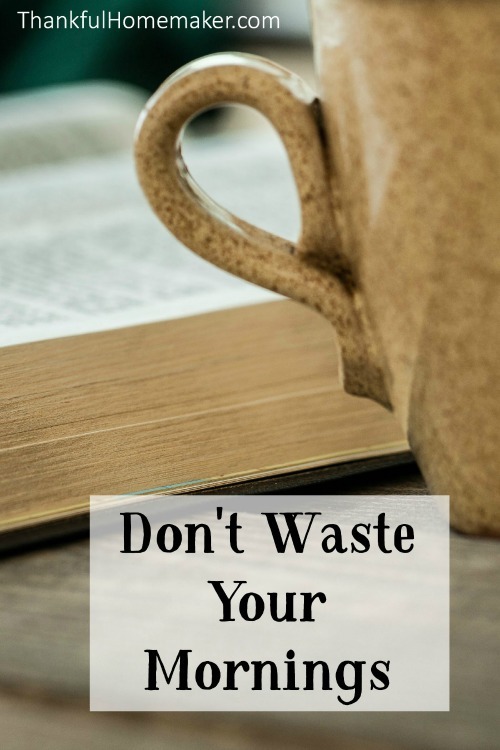 I was listening to Don't Waste Your Mornings Ask Pastor John Podcast and appreciated the wisdom he had to offer on making the most of our mornings. In our technologically minded world we can easily get caught up in checking our phones or email first thing in the morning before we have sat at the feet of our Lord. Some of the reasons Pastor John gave for doing this hit home with me. I am guilty too many times of checking my phone before checking my Bible. We may want a boost to our ego to see how many “likes” we got on a Facebook status. It is a quick way to avoid responsibility or the hardships we have to deal with in getting our day started. Sometimes it's the desire to be mindlessly entertained instead of engaging my mind. What if I check my phone first thing in the morning and I am the first one to come across some bad news in my email? Or what if on Facebook instead of “likes” I find hateful comments on a status? I've not even taken the time in the morning to be prepared for the battle! Was that 5 minutes of me checking my phone worth being drug down to small minded things?? A good morning starts the night before. If you're going to make good decisions in the morning, you need to plan ahead. When you wake up in the morning may it start first thing with a cry out to the Lord. Let Him know you love Him and need His help. Do this before you pick your head off the pillow. Take the time the night before to set out your reading materials in the morning. (See My Morning Time with the Lord here). You're strengthened in the Lord for whatever the day may bring. You have not wasted precious time given to you by the Lord, and it is more freeing to check that phone after you have prioritized and put the important things first. You are reminded of how your Heavenly Father cares and loves you after sitting at His feet first thing in the morning. Jesus is enough. Your time hearing Him speak to you through His Word will be a sweet reminder all through the rest of your day. 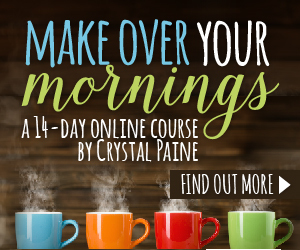 If you need a jumpstart to your mornings and a little motivation I highly recommend Make Over Your Mornings from Crystal Paine. I'm going to go through it a second time because it is just that good!! 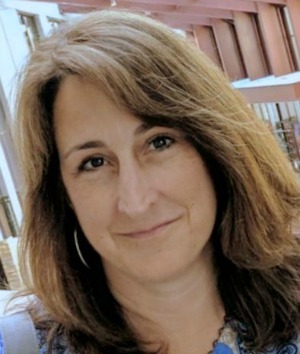 15 minutes a day for two weeks and you get to visit with Crystal and her family in her home. You won't be disappointed, and it will encourage you to make some good choices with how you spend your mornings that will affect the rest of your day.